Donating to the conservation and preservation of objects in the UWM Art Collection can be a rewarding experience and ensures the proper care of art. Your funds provide for the protection, preservation and if needed, restoration of your adopted artifact through professional conservation efforts and archival materials. You gift will specifically underwrite the cost of the conservation or preservation of the selected work of art. Preservation Needs: This liturgical object needs a 12W x 31L x 8.25H inches Gaylord Archival Corrugated Polypropylene Shallow Lid Multipurpose Box with Metal Edges. It is made from an extruded fluted plastic that is chemically inert and double-walled for extreme durability. Preservation Needs: This set of 6 lithographs needs 4 milimeter Archival Polyester Sheets from Gaylord Archival: These sheets are perfect for encapsulation, folders, book covers and special enclosures. Each sheet is pre-sized for convenience—simply seal with double-sided tape. The safe inert material has an inherent electrostatic charge to keep contents in place. Condition: The bronze surface of the sculpture has fingermarks, minor scuffs, and abrasions overall. Some fingermarks have oxidized and darkened. There are minor dark spots of corrosion overall. Wood bases are dusty and grimy. Conservation Needs: The sculpture will be dusted and polished. Polish residue will be removed. The sculpture will be buffed back to the original highly polished surface. The wood base will be cleaned and waxed. Condition: The matte and porous surface shows evidence of embedded grime. The reverse of the plate is partially cleaned. There are minor scuffs and abrasions overall. Conservation Needs: The plate will be vacuumed to removed abrasive dust prior to cleaning. Several cleaning methods will be tested in a an inconspicuous area of the artwork for efficacy in removing dirt: dry cleaning, steam cleaning, or water cleaning. Preservation Needs: This print needs a 16.25 x 20.25 inch Archival Polyester L-Velope from University Products: With these unique and functional L-Velopes, you can safely insert (or remove) fragile paper or photographic items into a protective polyester storage enclosure. L-Velopes cling to the material they contain making complete enclosure unnecessary. Two adjacent sides are thermo-welded for long life. Sturdy archival polyester assures the utmost in safety, strength, clarity and longevity. Guaranteed non-yellowing and stable. Preservation Needs: This pastel needs a 4 milimeter Archival Polyester Sheet from Gaylord Archival: These sheets are perfect for encapsulation, folders, book covers and special enclosures. Each sheet is pre-sized for convenience—simply seal with double-sided tape. The safe inert material has an inherent electrostatic charge to keep contents in place. Preservation Needs: This sculpture needs a Blue E-flute Clear Shallow Lid Archival Multipurpose Box with Metal Edges from Gaylord Archival: Blue E-flute Clear Shallow Lid Archival Multipurpose Box with Metal Edges provides safe storage for documents, manuscripts, music scores, comic books and more. The clear lid allows viewing without opening the box. Metal-reinforced edges add durability to the overall construction. Preservation Needs: This print needs a 11.25 x 14.125 inch Archival Polyester L-Velope from University Products: With these unique and functional L-Velopes, you can safely insert (or remove) fragile paper or photographic items into a protective polyester storage enclosure. L-Velopes cling to the material they contain making complete enclosure unnecessary. Two adjacent sides are thermo-welded for long life. Sturdy archival polyester assures the utmost in safety, strength, clarity and longevity. Guaranteed non-yellowing and stable. Preservation Needs: This sculpture needs a Custom Box, 45h x 24l x 8w inches, from Gaylord Archival: The box will be made of sturdy Buffered, B-Flute, but will be lined with Unbuffered White Barrier Board. The box is made of three different materials, but it will be very sturdy, and offer the best protection for your artifact. 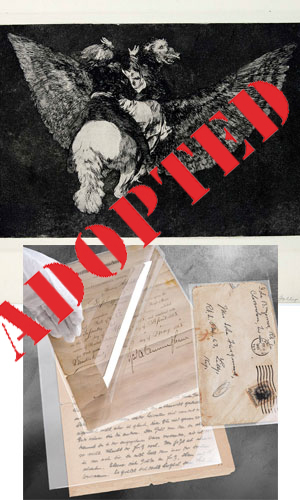 Thanks for all your support in adopting UWM Art Collection objects for preservation and conservation! Check back soon for updates on new objects to adopt! 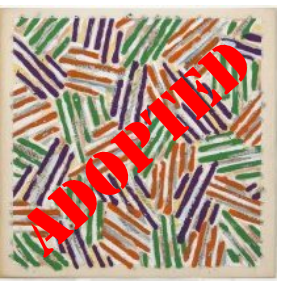 Please contact Leigh Mahlik (lmwilcox@uwm.edu, 414-229-4340) for more information about how to adopt art.